H. Jennings Bryan, Jr., 93, left this world on March 17, 2019. He was a native of Newport News, a graduate of Atlantic Union College, past president of the Pioneers Club, and served on numerous boards and foundations. He operated Century 21 Bryan Realty for over 50 years, retiring in 1989. He served on the Newport News Hampton Board of Realtors and was awarded a lifetime membership in the organization for his contributions to the industry. 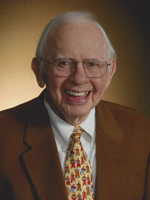 He was active in the Kiwanis Club for over 50 years, having served as President and Lt. Governor of the Capital District. He introduced the “Teenager of the Year” and “Terrific Kids” programs to the Peninsula. Recognizing accomplishments of local youth was one of his passions. He was a recipient of the George F. Hixon award. He was a member of Hidenwood Presbyterian Church, having served as a deacon and elder in the church. Jennings was preceded in death by his parents, Henry Jennings, Sr. and Marguerite Brooks Bryan. He is survived by his wife of 68 years, Mary Jane Bryan; his daughter and son-in-law, Pamela and Alexander Mackintosh of Atlanta, GA; his sons and daughters-in-law, Henry Jennings (Bucky) Bryan III and Susan of Newport News and Thomas David Bryan and Paige of Richmond; eight grandchildren, Laurie Gandy, Alex and Stuart Mackintosh, Katy Green, Jessica O’Reilly, and Mason, Taylor and Davis Bryan; and five great-grandchildren. A Celebration of his life will be held at 2:00 pm on Thursday, March 21, 2019 at Hidenwood Presbyterian Church. Interment will be private. In lieu of flowers, memorials may be made to the Memorial Fund, Hidenwood Presbyterian Church or the Sturge-Weber Foundation. Arrangements by Weymouth Funeral Home.